FOR FIVE MONTHS out of the year, Minnesota can be a tough place to live. The dread of winter starts on the morning after Halloween, and despite the pleasant respite we receive over the holidays (it’s always good to have a White Christmas), the gloom can stretch deep into March before we get a break up here. So, when summer comes, if you, as a Minnesotan, aren’t outside for every moment of warm sunshine, your friends, family, and neighbors will start thinking of you as peculiar. For those reasons, we have a lot of festivals during the summer. Every city, every town, every neighborhood, every local entity with any sort of recognizable identity will sponsor a summertime activity. With so many celebrations packed into so little time, we offer you a guide to the best festivals in and around the Twin Cities. For years — decades even — the Uptown neighborhood in South Minneapolis was the undisputed progressive nerve center of Minneapolis. It was the artists’ quarter of the Twin Cities and the place for the hip to congregate. In recent years, however, Northeast Minneapolis (or “Nordeast” to old-time Minneapolis residents) has staked its own claim as the artistic center of the Twin Cities. The old warehouses, breweries, and manufacturing facilities of the traditionally working-class neighborhood have now been converted to artists’ lofts and studios. In 1994, the North East Minneapolis Arts Association sponsored the first Art-A-Whirl, a studio tour of the burgeoning art scene in the area. 23 years later, Art-A-Whirl is now the largest open studio art tour in the country. Every May, more than 600 artists open their studios in a dozen official sites (and dozens more “unofficial” ones). Nordeast becomes a carnival of art lovers, food trucks, music, and of course, incredibly talented painters, sculptors, crafters and artisans hoping to sell their work. While patrons come for the art, they often stay for the music. Venues like The 331 Club, Psycho Suzi’s Motor Lodge, Grumpy’s Northeast and virtually every other establishment in the area with a liquor license offer wall-to-wall music. Northeast becomes a zoo, but it’s a colorful, sweet sounding place to be on a lovely May weekend. Soundset is the celebration of Twin Cities hip-hop established by local hip-hop record label Rhymesayers Entertainment. 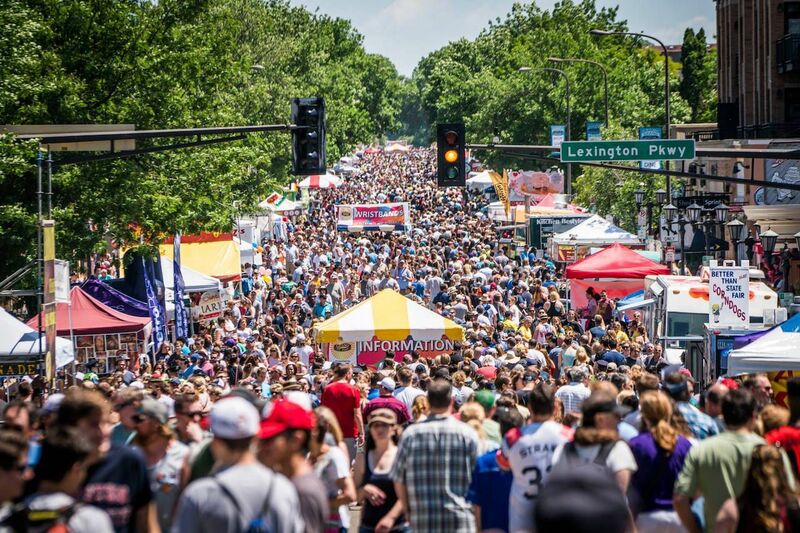 Held every year on the Sunday of Memorial Day Weekend, the festival regularly attracts more than 30,000 people. While the one-day bill is always stocked with Rhymesayers acts like Atmosphere, Brother Ali, deM atlas, and other Twin Cities hip-hop favorites like Dessa, P.O.S., and Lizzo, there are always big national performers as well. Past headliners have included Ice Cube, Common, The Roots, Cypress Hill, and Snoop Dogg. 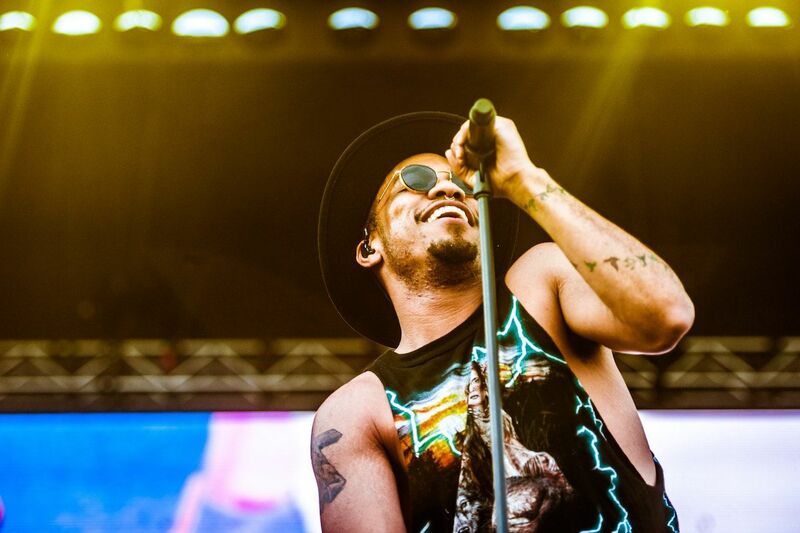 The 2017 Festival was highlighted by Lauryn Hill and T.I. The Twin Cities hip-hop scene is a fiercely proud community that delights in putting themselves on display, knowing full well that they match up with anyone, anywhere. It’s only one-day long, and on a Sunday at that, but St. Paul’s Grand Old Day is very possibly the biggest party of the year in the Twin Cities. Every year on the first Sunday of June, thousands of people fill a 2½ mile stretch of Grand Avenue, divided into four separate “districts.” One area is filled with six “performance gardens” with live music; another offers a massive art fair; another family activities, and still another for sports and wellness with interactive games, sports mascots, Minnesota outdoors vendors and tips for staying healthy. The whole event starts off with a huge parade at 9:30 AM and goes until sundown (and usually past). More than 100 food vendors mark the street, and the local breweries, wineries, and distilleries are all well represented. The police have tried to take control of public intoxication in recent years, but Grand Old Day is still the first great rite of summer for St. Paul residents and anyone else who wants to visit for the day. This being Minnesota, the weather can be a bit unpredictable (we’ve seen snow in May here three of the last five years). 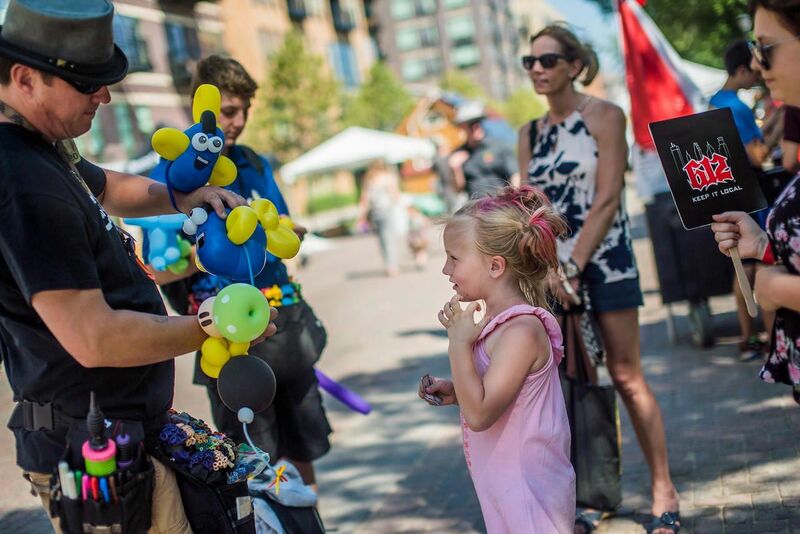 But by Father’s Day weekend we’re guaranteed to have summer-like temperatures, making it the perfect weekend for the Stone Arch Bridge Festival. Named for the historic Minneapolis landmark, the Stone Arch Bridge Festival is half art fair, half music fest. Featuring more than 200 artists and artisans, the Northeast bank of the Mississippi is beset by artists’ tents showing paintings, jewelry, sculpture, leatherwork, woodwork, photography, glasswork and much more. Meanwhile, local musicians fill three different stages throughout the festival grounds, offering constant live music from morning to dusk. Attendees can enjoy the folk rock stylings of Jackson and The Roosters on one stage and then wander over to hear a little old time jazz from Kate Lynch and Her Most Excellent Fellows a couple blocks away. Organizers have even integrated a car show over the last few years, making this the most eclectic and enjoyable festival of the year. While the Minnesota music scene is strong in hip-hop, indie rock, Americana, country and classical music, it can be lacking for jazz lovers. Minneapolis and St. Paul each have a couple good jazz clubs, but jazz is not the music you should come looking for in the Twin Cities — except for three spectacular days every June. 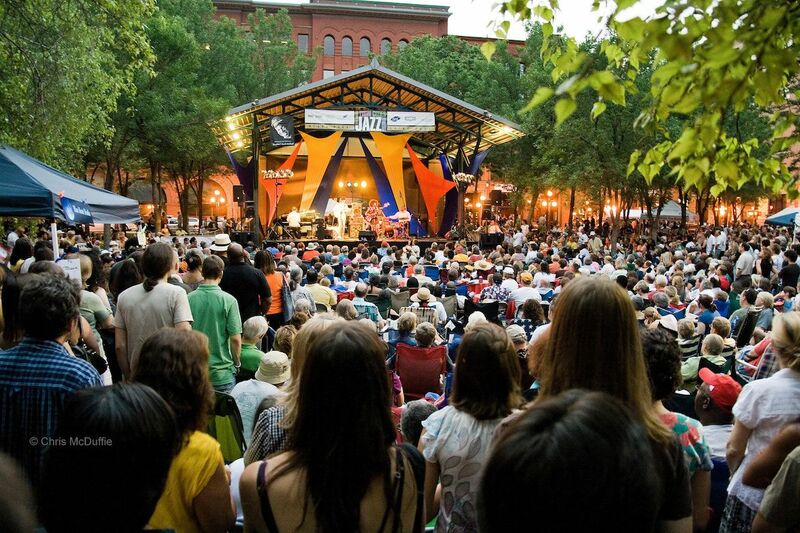 The Twin Cities Jazz Festival seems to pack nearly a year’s worth of jazz performance into one weekend, where there are no less than twenty-nine stages, all dedicated to this American art form. Clubs like the Amsterdam, the Bulldog, and Barrio hand the entire weekend over to jazz musicians. There’s music at the St. Paul Hotel, Golden’s Deli, and the Citizen Supper Club. Outdoor stages are set up on street corners, by the riverside and in all the major city parks (two, in fact, in Mears Park). This is the best opportunity of the year for Minnesota jazz lovers to see some of the real masters of the craft. This year, headliners include Terence Blanchard, McCoy Tyner, Joshua Redman and Emmet Cohen. In 2011, The Advocate proclaimed Minneapolis/St. Paul to be the gayest city in America. In the years since, we have rarely, if ever, dropped out of the magazine’s Top Ten. 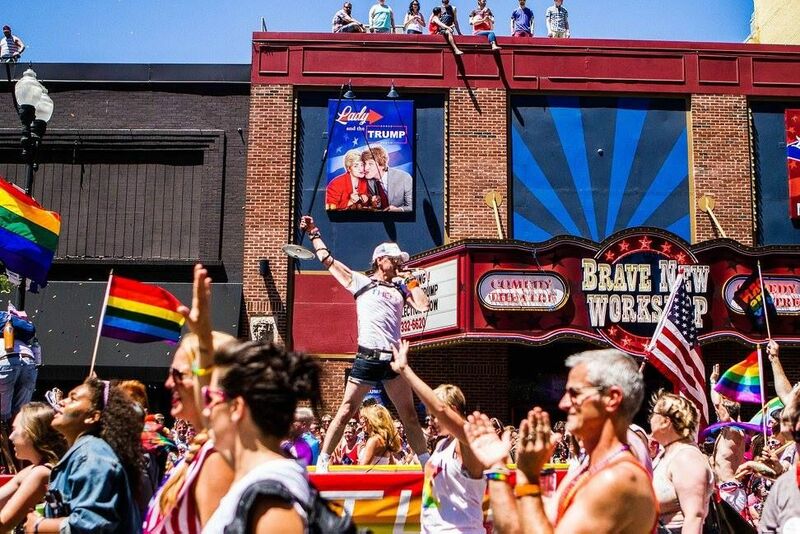 For years, the Twin Cities has been one of the LGBTQ+ friendliest communities in the country and one need to look no farther than the annual Twin Cities Pride Festival for proof. Loring Park sets up more than 400 vendor booths every year, with dozens of food vendors and four separate stages for live music. The family picnic in Como Park is one of the largest in the country. The parade, which marches the length of Hennepin Avenue from 3rd Street to the festival in Loring Park, annually attracts 400,000 people. 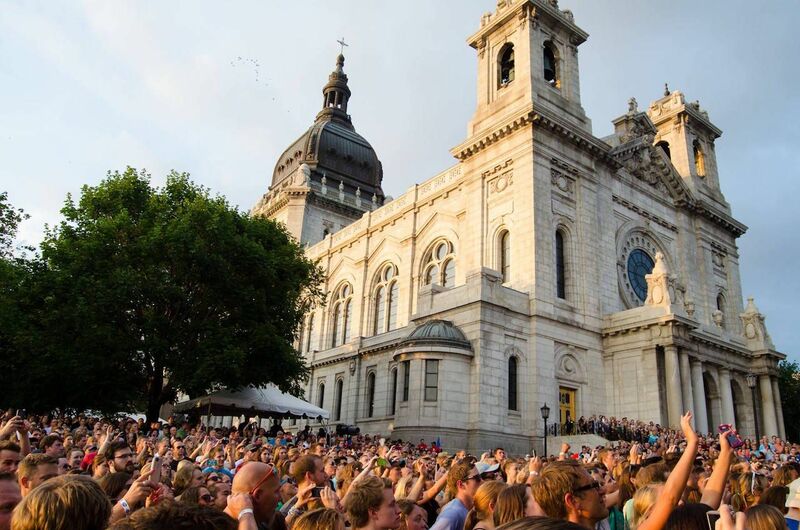 The Basilica Block Party is an annual music festival hosted by adult-contemporary-pop station Cities 97 and the co-cathedral of the Roman Catholic Archdiocese of Saint Paul and Minneapolis, The Basilica of St. Mary. While most people don’t pair major music festivals with stately old churches, particularly the oldest basilica in the United States, this is a partnership that has not just worked, but thrived now for more than 20 years. The Twin Cities do not have an outdoor amphitheater that seats more than 2000 people, so when summer music festivals are organized, creativity is a must. So why not set up three stages on the basilica grounds and invite 15,000 people to enjoy the weekend after Independence Day watching their favorite bands and drinking their favorite adult beverages? When all proceeds go to the renovation and upkeep of this Twin Cities landmark, it’s easily justified. Just about every town in Minnesota has some kind of a weekend-long celebration/festival where they get out all the fire engines and convertibles in town and, along with the local marching band, parade down Main Street. Minneapolis, being the largest city in Minnesota, does essentially the same thing, just on a much grander scale. The Minneapolis Aquatennial, which happens mid-July every year, is, by many measures, another kitschy festival. But the things that set the Aquatennial apart from the rest of the statewide festivals are actually staples of all these little parties: the parade and fireworks. The Aquatennial Torchlight Parade is a spectacular nighttime parade of lights. 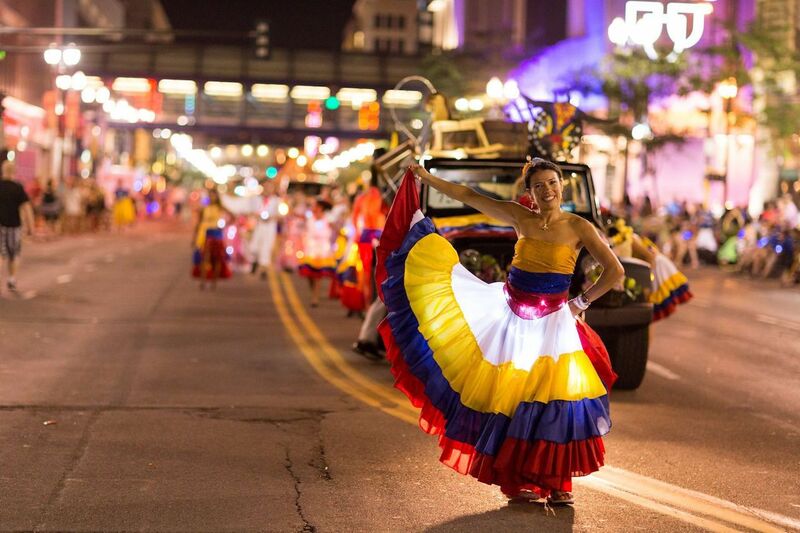 Every year on the first night of the celebration, lit up floats, marching bands, royalty and all sorts of acrobats, clowns, and fire breathing daredevils wind down Hennepin Avenue in one of the largest nighttime parades in the country. An annual joint venture between public indie rock radio station 89.3 The Current and the venerable Walker Art Center, Rock the Garden is always one of the most anticipated events of the summer for Twin Cities hipsters, Millennials, and anyone who gives a damn about good, contemporary music. The setting is as good as it gets, using the natural amphitheater created by the gigantic hill just adjacent to the Walker to accommodate the 10-12,000 attendees. The stage is set against the spectacular and recently expanded, Minneapolis Sculpture Garden. 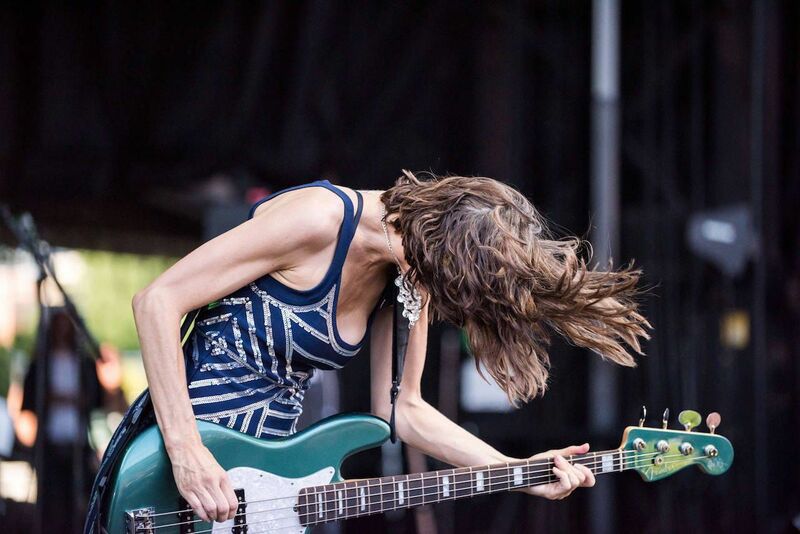 Past performers at RtG have included The Decemberists, Bob Mould, The Flaming Lips, and De La Soul. Usually held in mid-June, the 2017 edition of the festival has been pushed back to July 22 to accommodate the schedule of headliners Bon Iver. Other performers this year will include Car Seat Headrest and hometown pop/funk heroes The Revolution. The Uptown neighborhood in South Minneapolis is famous for the three lakes, Harriet, Calhoun, and Lake of the Isles, on its Western edge. It’s famous for the song Prince wrote about it. And it’s famous for one big art festival. Held every year during the first weekend of August, the Uptown Art Fair is the largest in the state. 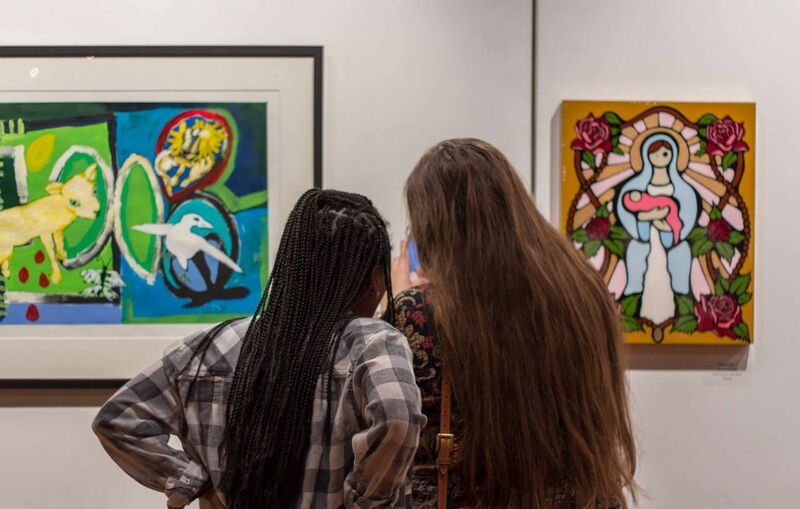 More than 350,000 people visit every year to see, and purchase (annual sales can top $2 million) works by some 350 different artists, each one hand-selected by a panel of artists and critics. More than twenty local restaurants (also hand-selected) set up booths in the neighborhood every year to complement the dozens and dozens of the neighborhood’s established eateries, and the live music stage always showcases some of the best in local music, dance, and comedy. 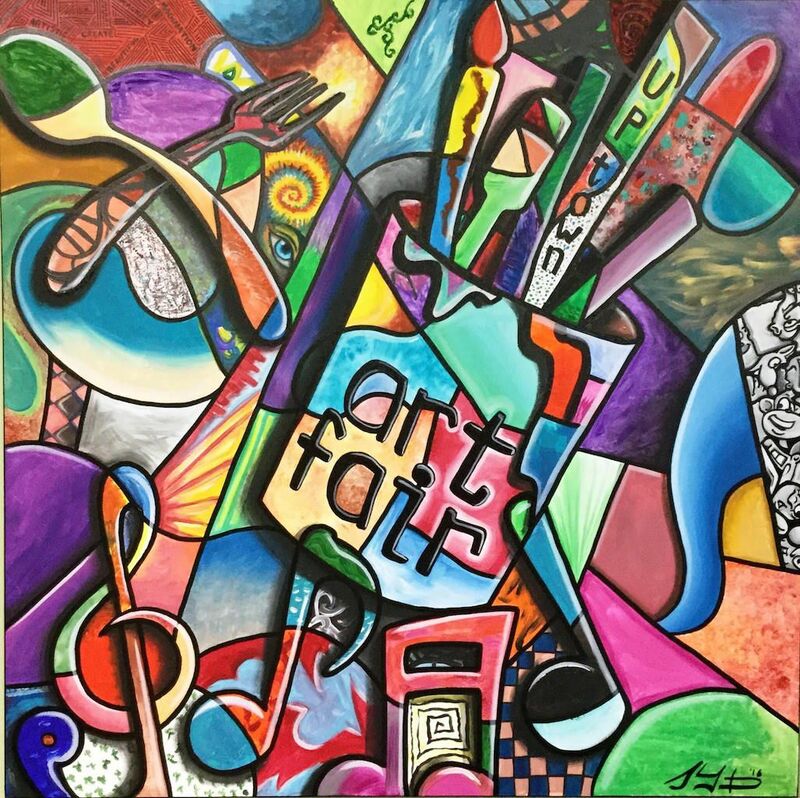 Minneapolis is an arts community at its heart, and the Uptown Art Fair is the beating center.